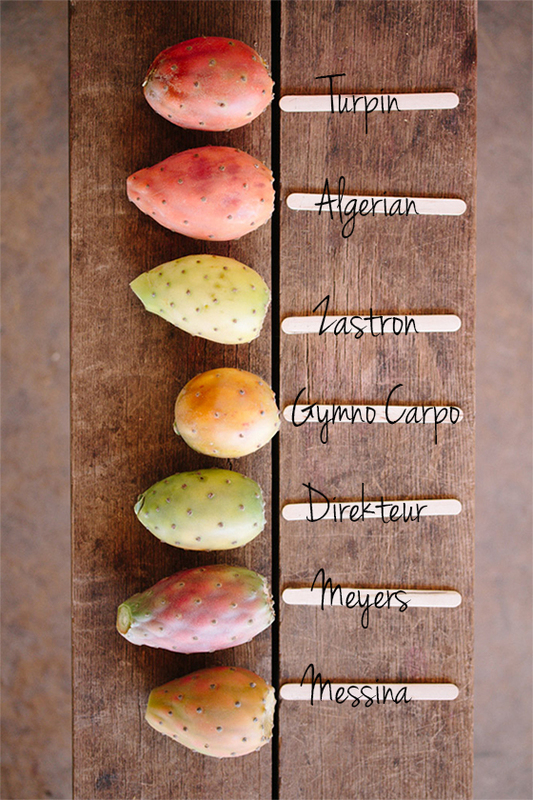 The bountiful late-summer produce from the farm includes a Babylonstoren favourite….prickly pears in all colours. 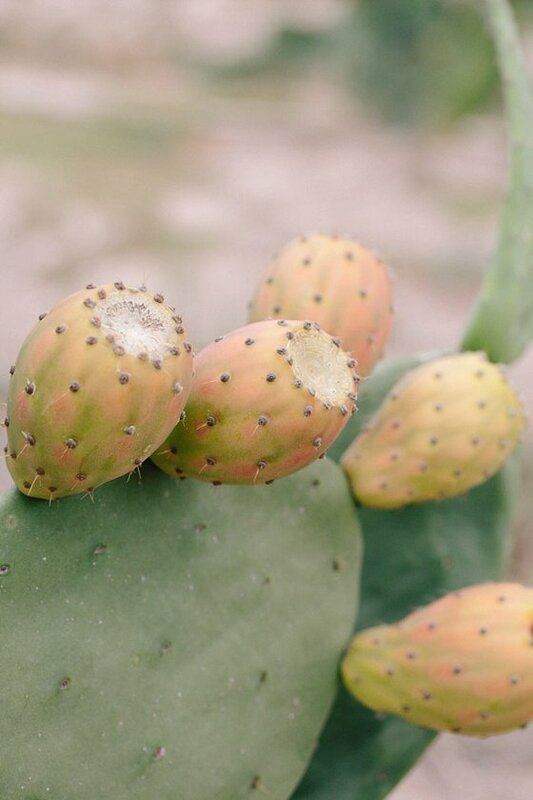 Delicious, versatile and easy to grow from a single leaf (with good selection and tight control), the prickly pear promises to be back on the foodie scene. 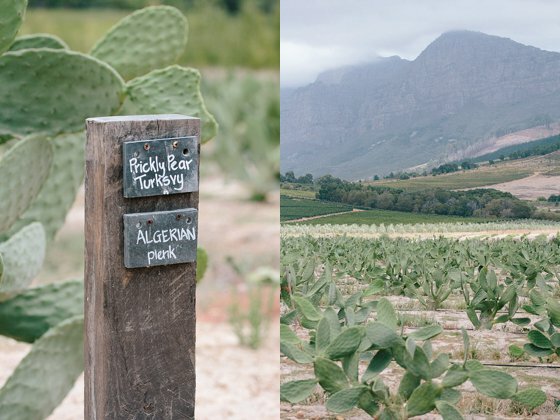 Prickly pears have such a rich past in South Africa, that they are considered by many as “South African”, but in fact the prickly pear (or cactus pear) hails from Mexico and Central America, and was brought to our southern shores in the late 1700’s. 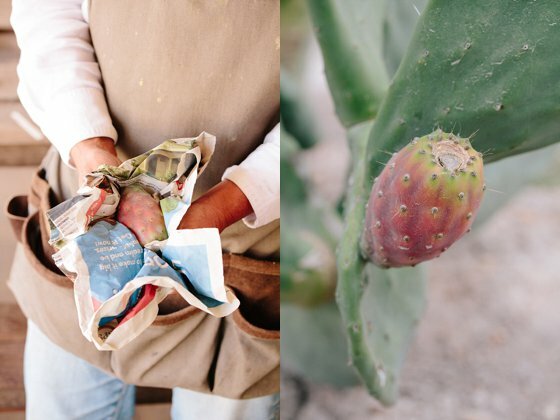 Apart from the prickly pears in our garden’s famed prickly pear maize, we have no less than 11 varieties of Opuntia ficus- indica growing on the farm, and they are in season now! This “cinderella” of the fruit community has countless uses; we’re also trying our hand at ink-making, using the deep purple-coloured fruits of Opuntia robusta from the garden. Hannes, our farmer, invented this handy contraption to harvest the prickly pear. But the old-fashioned way of harvesting, with a tin attached to a stick, still proves to be the most effective for those hard-to-reach delicacies. 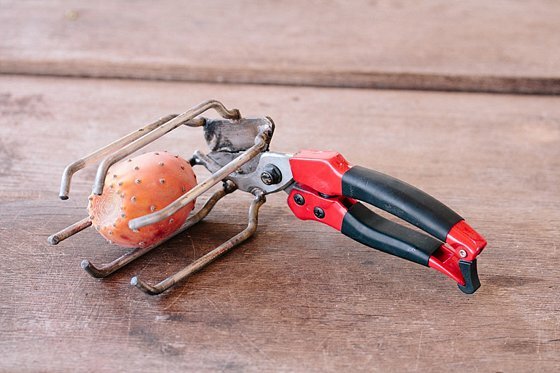 Tip: Get rid of most of the spines, by rubbing the skin of the prickly pear with newspaper, alternatively use protective gloves when working with this cheeky fruit. Just some of the varieties that are fruiting now, and the chefs, farmers, and garden team are in agreement that the “Messina” and “Zastron” variety has the best flavour, whilst the “Meyers” variety has the most beautiful colour – a vibrant, hot pink! Stick the fork in the side of the prickly pear. Cut off each of the thorny ends and discard. 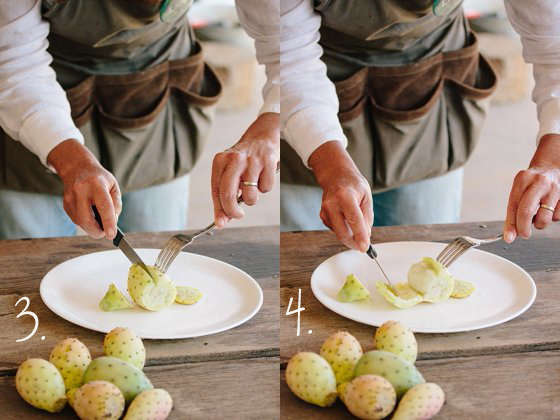 Make one long vertical slice down the body of the prickly pear. You need to cut through the skin of the prickly pear and not into the flesh of the fruit. 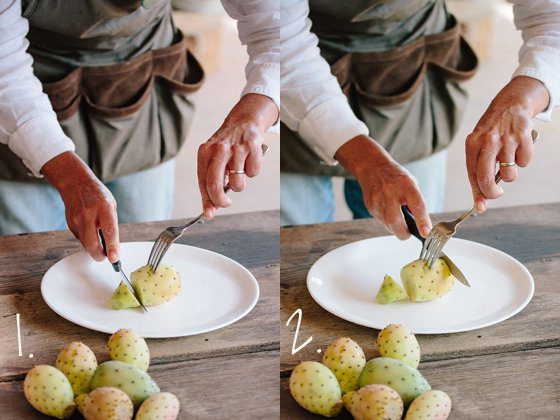 Peel the skin off the fruit using the knife and fork. 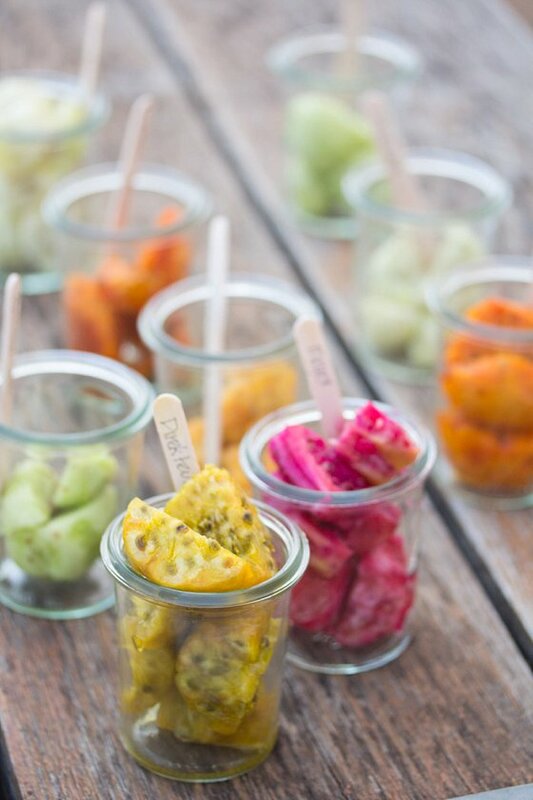 Place the peeled fruit in the fridge and enjoy a few hours later, ice cold! Gorgonzola was the very best ever. I shall order it again and again. The men had the longest fattest Boerewors Rolls. Your salad presentation in consol jars was novel and delicious. The service was excellent with Marilisa. experience amongt your vast array of orchards and veggie gardens! Where can I buy a plant? You’ll seldom find them at nurseries, but you can easily grow them from a single leaf. Your best bet is to ask for a leaf when you come across a variety you like. If you live close by, we’ll gladly give you one. My BEST fruit, I can make a meal of them! Always buy them when I find them. My grandmother used to roll them in sand with a broom to remove thorns. NOTHING really works 100% so always use the knife & fork! !